I am once again indebted to Malcolm Cross, Head of Product Design at Peter Symonds College, Winchester, for providing some excellent ‘showcase’ examples for this piece. Last month, I looked at a great example of intricate 3D Printing and some highly competent use of SolidWorks to develop the design. This piece looks at the opposite end of the scale and how Malcolm’s students have embraced their new TechSoft RouterCAM 1290 to create larger scale projects. Of course size isn’t the thing when it comes to assessment; ‘clever’ projects will always be what matters. Having a RouterCAM alongside uPrint 3D Printing and more modest CAD/CAM resources means that Malcolm can let students focus on ‘clever’ almost regardless of scale. There are logistical problems of course. It is a truism that nobody will ever have enough storage and visiting PSC’s Product Design studios in late May clearly showed how Malcolm and his team have to carefully manage student’s aspirations! The College took delivery of their RouterCAM in November 2012 and immediately started making use of its maximum potential for straightforward 2D profiling and adventurous 3D machining. 2D Design, SolidWorks and Visual Toolpath (included with every RouterCAM) gave them all the software tools they needed. Being this adventurous this quickly meant quite a steep learning curve and TechSoft were delighted to be able to support PSC at every step. We know how capable RouterCAM machines are but when customers push the boundaries we value the chance to get involved and add to our store of knowledge. 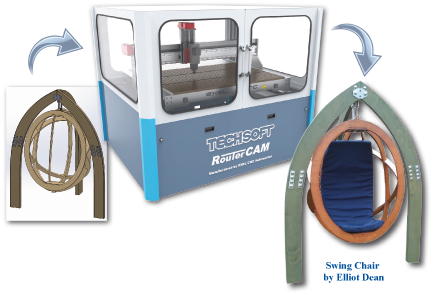 TechSoft offer two sizes of RouterCAM. Most schools and colleges will opt for the same 1290 model PSC have but (if you have the space) we also offer the 1224 model. Just as simple to operate but now with ability to accept full 1220 x 2440 boards in one go. Now that is big!